What areas of Mozingo can I hunt? 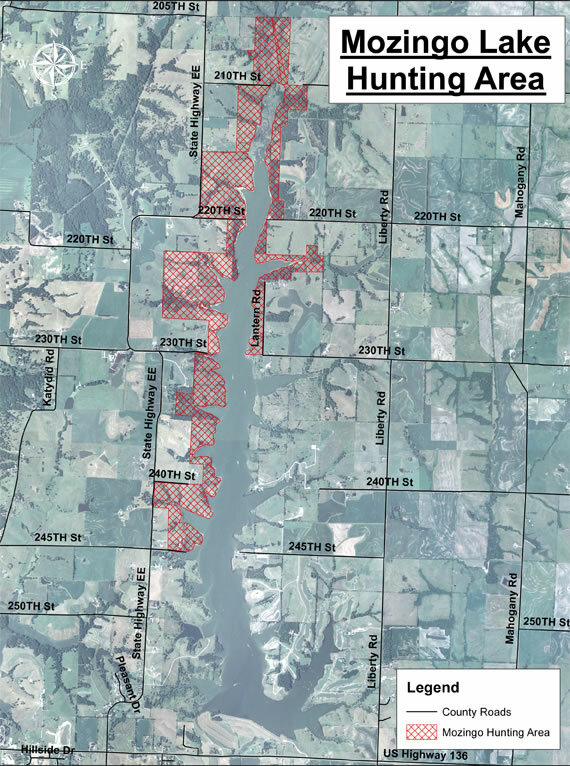 Click here to view a map of the Mozingo Lake Recreation Park hunting zones. To summarize it, hunting is permitted north of 245th street on the west side of the lake; and north of 230th street on the east side of the lake. What are the hunting seasons for the park? Our hunting seasons mimic that of the Missouri Conservation Departments’. For a full listing of hunting seasons, please visit http://mdc.mo.gov/seasons/hunting. What weapons and special equipment may I use for hunting on your grounds? Archery and shot guns are permitted for hunting on our grounds. Single projectile firearms such as rifles are not permitted. Tree stands and traps that are compliant with the Wildlife Code of Missouri are also permitted. Can I trap on Mozingo Lake? Trappers will need to contact us for permission to trap. We will need the following information: where you plan to set your trap, what type of devices will be used, how long you intend to have the trap on our grounds, and your contact information. Do you sell hunting/trapping permits at Mozingo Lake? No. Hunters will want to visit http://mdc.mo.gov/permits for hunting and trapping permits.